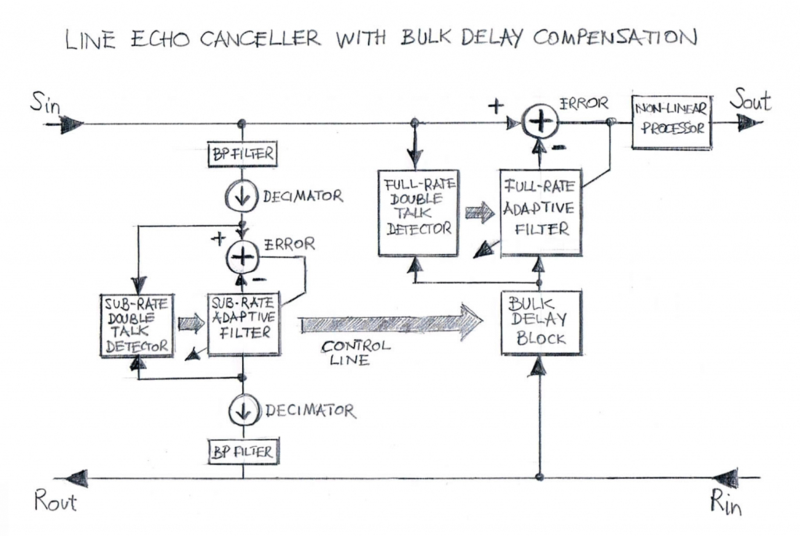 A modified line echo canceller with bulk delay compensation offers multiple advantages for access network configurations with signal delays between the line echo canceller and hybrid circuit ports. In certain access network configurations there is significant delay between the 4-wire-to-2-wire converter (a.k.a., hybrid circuit) and the input/output ports (Sin and Rout, respectively) of the echo canceller. An example of such a network configuration is depicted in Figure 1. 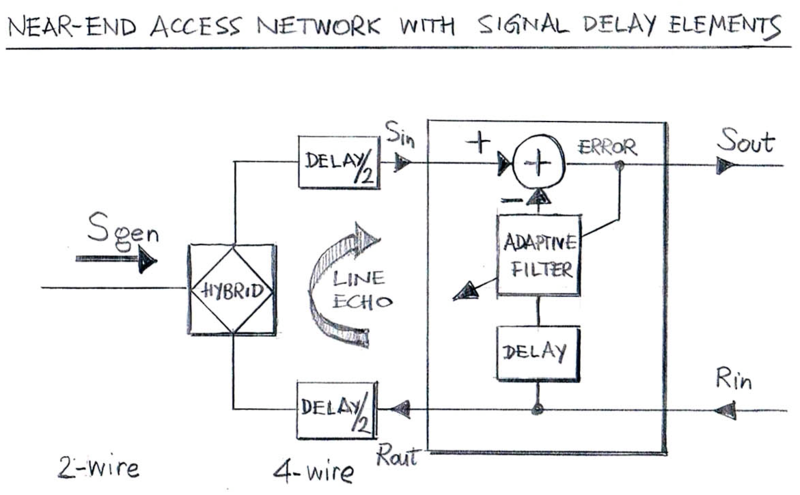 While a typical line echo canceller may be suitable for the application in the access network configuration in which there are signal delays at the near-end of the 4-wire interface (provided the provisioned echo canceller’s echo path delay coverage is adequate, that is it covers not only the hybrid dispersion segment but also the delays), there is an opportunity to use a modified echo canceller with bulk delay compensation. A high-level block diagram of such an echo canceller is illustrated in Figure 2. Smaller computation cost (reduced MIPS requirements for the adaptive filter), as the shorter adaptive filter has fewer coefficients that need to be computed during the adaptation process. Due to the fact the adaptive filter convergence is deeper (as previously mentioned) the non-linear processor operates in a less ubiquitous fashion. As a result, any adverse effects generated as by-products of non-linear processing take place less often. VOCAL’s Line Echo Canceller with Bulk Delay Compensation design has been tested in environment manifesting signal bulk delays (a.k.a. pure delays or flat delays) at the near-end of the 4-wire interface. It can be ported onto any of the typical DSP processors and then made ready for deployment in a customer network environment. Please contact us to discuss your line echo canceller application requirements.